I am an introverted shy person. 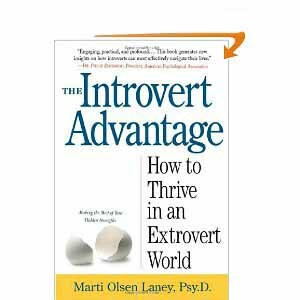 I have always suspected this, but it was verified after I completed the long version of the "Self-Assessment for Introverts" test, which I found in the book "The Introvert Advantage by Marti Olsen, Psy.D. found here on Amazon.com. Well okay, I kind of didn't have to take the test to know that I am a shy introvert. But, I am a sucker for these personality type of tests. Anyway there were 29 true or false questions. The scoring is based on how many questions you answered True to. "Pretty darn introverted." Really that's what it said. Oh, and it also said that I can now be referred to as an "innie", as opposed to those who are extroverted. They are known as "outies". I get my exercise by going to Curves 3 - 4 times a week. I usually go at the same time, between 8 - 9:00 a.m. Consequently, I see the same people. I happen to know a lot about the individuals who make up the eight o'clock group at Curves. For instance I know that Tracy's mom passed away recently and she is having difficulty dealing with her stepfather. I know that Claire is nervously awaiting the results of her husband's PET scan. Patty, originally from Boston and new to the area, knows everyone by name (except for me) and will individually inquire about their health, how they liked that restaurant they went to last night, and how the children or grandchildren are doing. Now I (unlike Patty who will actually talk to people) know all of these things because I overhear conversations, surely not because I participate in them. "In general, I like to listen more than I like to talk." Which I, of course, answered True to. Yesterday I happened to bump into a casual acquaintance. By casual I mean, I occasionally bump into Shirley at the Shop Rite. And since Ross does most of the food shopping, my bumping into's only happen a couple of times a year. The conversation is always very superficial, "how bout this weather, huh?' Or, "did you see that lobster tails are on sail for $4.99 a pound today?" Judging by what I have seen in Shirley's shopping cart, we seem to like the same kind of foods. But other than that, I couldn't tell you what else we might have in common. "I don't think of casual acquaintances as friends." Lately, though, I have been experiencing a strong urge to reach out to "casual acquaintances". I did the most non-introverted thing the first time I went back to curves after Joe passed away. Normally, when Carole, the manager, greets me in her always cherry, upbeat voice, with "Good Morning, Lynda. How are you today?" I would mumble "good, how bout you?" But that day, I quietly said, "I'm sad. My son passed away a week ago." Carole immediately came out from behind the desk and gave me a hug. That felt really good. As I started to exercise, Claire happened to choose the machine next to me. Now I have to say, Claire is the nicest person. Or at least she just seems to be, as I have never really had a conversation with her, but she just gives off that vibe, you know? Normally I don't make eye contact with anyone, because, heaven forbid they should try to converse with me. But, that day I looked at Claire and managed a little smile. She asked if I was all set for Christmas. I told her that "No, you see my son passed away a week ago and I am very sad." Claire immediately stopped exercising and gave me a hug and a lot of comforting words. That felt really good. And yesterday, when I bumped into Shirley at the Shop Rite and she asked how my holidays were, I replied: "My son passed away on Dec. 5 and I am very sad." Shirley reached out and put a hand on my shoulder. As she expressed her sympathy and concern, her hand never left my shoulder. That felt really good. Obviously, I feel quite comfortable expressing my deepest feelings when I write. Interestingly enough I feel connections to the people I have "met" in the blogging community. I have been quite comforted by the outpouring of support and love shown to me by those who read my blog. Of course I understand the reason that I am able to step out from behind my "pretty darn introvertedness"(just made that word up) may be the allusion that I am "hiding" behind my seeming anonymity. What I am struggling with now is how to tap into those human to human, face to face, connections. I know the desire is there, somewhere deep inside of my introverted being. 1. What things in my life are most important to me? 2. What would I like to contribute to the world? 4. How can I make these things happen in my life? 5. Who are the people I want to be with on my journey? "I usually like to think before I respond or speak." Which I, of course, answered True to. My son was also very shy and introverted. That is until he was diagnosed with stage IV colon cancer. That devastating news was a hard blow and seemed to crack the hard shell he had surrounded himself with. His sense of humor became more apparent as his witty quips were said out loud instead of silently to himself. He started to make eye contact with people and would smile a lot more. He was a caring person, and he started to show that side of himself by asking out loud "how are you doing" instead of wondering that to himself. So, the mother learns a lesson from the son. After my Shop Rite acquaintance "friend" Shirley finished expressing her caring words, I looked up at her and smiled. I asked how she was doing. I found out that Shirley's daughter is battling breast cancer. I put my hand on her shoulder and listened as we innies so often do. That felt really good. You know what feels good? Knowing that when I first "met" you, I was overwhelmed by your sense of sadness; now I am overwhelmed by your sense of resiliency. I loved the way you made things turn around so that you were the listener for Shirley, and that it was your hand reaching out to steady her. That's the way it has to work. And your ability to put it into words is the signature on your resiliency. All this is to say I enjoyed your post. I am also familiar with the power of self revelation. Once I do open the door and let someone into my inner world (no matter how sad, scared, lonely, disconnected I might feel), I often find that connection that makes me stronger. I am an introvert too and I try and try to shake it but for whatever reason I just like to listen and I am with my circle. I hope to find a happy medium someday. I love your blog. I would have NEVER pegged you as an innie. I always get so much out of what you write. You make me think. Sometimes you have made me smile. Sometimes you have made me cry. I am not sure where I am going with this, but I always look forward to reading what you have to say. I am shyly honored by your comments. Thank you. By the way, I enjoy the feistiness of your writings. You make me smile. You know, innies have so many good qualities. Perhaps instead of "trying to shake it" the better thing to do would be to embrace our uniqueness. Thank you for your recommendations. I checked out both books on Amazon. I found Quiet to be most interesting. I will definitely download it onto my Kindle when it comes out in the next couple of weeks. I felt the same way as you when I read the Introvert Advantage - someone finally understood me.